The geomorphology of the nine UNESCO Dolomite systems makes up a unique mosaic on a world scale that, in a restricted area, contains a wide variety and density of shapes and surface modelling phenomena, unequalled for its geomorphological diversity that is on full and glorious display and thus is relatively easy to read. 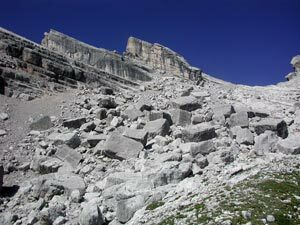 The extraordinarily dynamic Dolomite landscape has been in a state of constant evolution since the Miocene era when the rocky layers began to emerge from the sea where they had begun life as sediment, slowly to become mountains, now at the mercy of erosion. 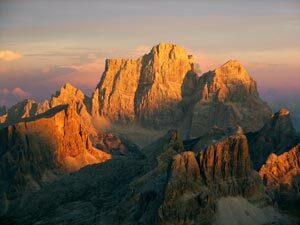 The Dolomites owe their complex, awe-inspiring silhouette to a happy combination of structural and climatic factors. The former shape the principal features of the landscape and are the result of a surprising diversity of rocks and petrified architecture, their geodiversity. Climatic factors enhance the various degradation and erosion processes that have been working on the rocks during the more recent geological eras. These include water, ice, freezing/thawing, karstification and gravity. The geological vicissitudes undergone by the Dolomites are so remarkable that they have left a rich supply of material for Mother Nature’s sculptors to work on in minute detail. These sculptors, or carvers followed the natural lines presented to them by the planes and surfaces created by the inner structure of the material. It is therefore not by chance that the Dolomite topography, the surfaces on which we walk or possibly clamber over with aid of our hands, presents sheer walls of the limestone and dolomite rock these fossil islands are made of, abruptly rising out of the gently rolling meadowlands and wooded slopes created by sediment from volcanic activity and from the depths of the ocean. These processes, that have worked their magic over the course of the millennia to present us with the landscape we gaze upon today, have transported and repositioned the raw materials to create geological formations and spaces in which human settlements have flourished in the earth’s more recent history. The Dolomites have always been considered an open-air laboratory, ideal for research and educational activities whose aim is to understand the complex phenomena that result in the ultimate demolition of these mighty peaks and to develop techniques to reduce hydrogeological risks.